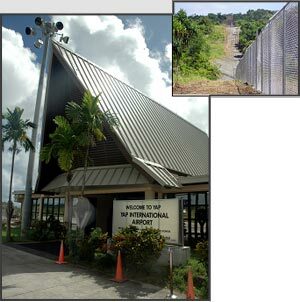 The Yap Airport Terminal Building Rehabilitation, Installation of Perimeter Fence, and Upgrade of Lighting and Signs project is an upgrade to the existing Yap Airport facility. The work included the selective demolition and removal of portions of the terminal building, the complete removal of the perimeter fencing, and the selective removal of airfield lighting and signs. It also included the new construction of the 8’ high airfield perimeter security fence and gates, extension of the departure waiting area including structural and architectural finishes, entirely new wood framing with metal roof system, extensive building electrical works including the replacement of all fixtures, new public address system, new lightning protection system, the replacement of airfield lighting and signs, and an upgrade to the apron flood light system.